I will love you with every breath and I will show you what it really means to love. I want to talk to you with the rhythm of blood racing and the music of life itself. Just be quiet, my love, only then might you hear it just as I do … I love you. My whispers of love like a soft call that floats like fire and ice on the wind. Seeking, searching, looking for you… restless until you are found. Sometimes I want to yell out my love for you. Other times, I just want to send my whispers of love to your ears only. 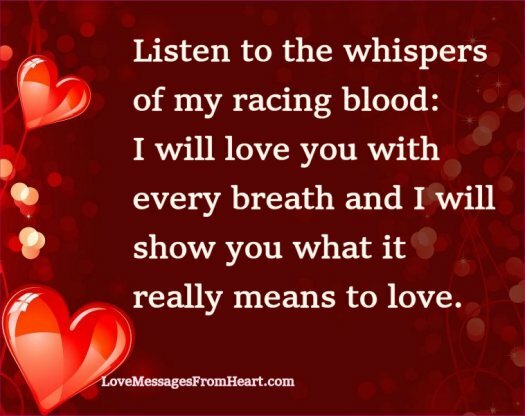 My dear, hear my whispers of love. If your ears can’t hear them, search your heart. They travel from my heart to yours. I have so many things to tell you, yet my words are so inadequate. Please rest your head on my chest and listen. Each and every morning, I want to be only a pillow whisper away from you. I love to see your smile as you open your eyes, awakening from your sleep. I never want to lose that. I really enjoyed this website..its contains words that cannot be found elsewhere…. I really enjoyed your messages is different from other sites, where else they keep using same messages all the time but this site is different and i think is the best i have ever seen.